Ernie Carter’s VFL career at Richmond and Carlton spanned more than ten years, yet included only 21 senior matches. A tall utility who took a good grab, he was something of a drifter throughout his playing days, and rarely stayed long in one place. Born in inner-city Richmond in 1889, Carter made his VFL debut for the Tigers in Round 1, 1910 with a loss against South Melbourne at the Lake Oval, Albert Park , only to bid farewell to Punt Road after just that one appearance. Six years later, he was playing for Balmain in the Victorian Metropolitan Football League when Carlton persuaded the 27 year-old to have another tilt at the big time. 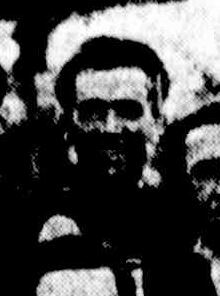 Carter turned out in navy blue for the first time in June 1916, playing alongside full-back Ernie Jamieson in the last line against Collingwood at Princes Park. The Blues won by 12 points, in Carter’s only appearance for the season. He did considerably better in 1917 however, lining up in 10 matches, and kicking three goals from limited chances. He played as a follower in Carlton’s Semi-Final loss to Fitzroy, then promptly called it quits and departed for destinations unknown. Three years later in 1920, Carter bobbed up again at Princes Park, pulled on guernsey number 9, and resumed his career. He played nine more games – including two finals - before retiring for good after Carlton lost the Preliminary Final to Collingwood. Carter passed away on the 25th April, 1955 aged 66. Contributors to this page: WillowBlue , Jarusa , Bombasheldon , molsey , PatsFitztrick , tmd1 , p(12)terg , keogh , true_blue24 and admin . Page last modified on Tuesday 20 of October, 2015 12:32:57 AEDT by WillowBlue. 1998 Rd 1 - Brad Pearce.